Young Audiences New Jersey & Eastern Pennsylvania’s Gala, DAZZLE: MAD HOT BALLROOM Dancing Through The Decades, Raises over $200,000 for Arts Education! PRINCETON, NJ; May 3, 2017 — On Saturday, April 22, Young Audiences New Jersey & Eastern Pennsylvania (YA), the area’s largest arts education non-profit, celebrated with a special black tie gala, Dazzle: Mad Hot Ballroom, Dancing Through the Decades at the Princeton Hyatt. The benefit included a performance by students of YA’s Camden Adopt-A-School initiative currently participating in a hip hop dance residency, and a dance competition a la “Dancing With the Stars” where VIP dancers were paired with professional dancers. 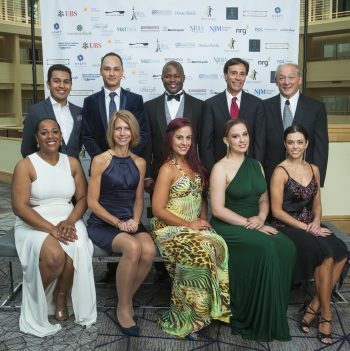 Dazzle VIP and Professional Dancers from Fred Astaire Dance Studio – (back row from left to right) Juan Ramirez, Ilya Abdullin, D.A. Graham. Mark Murphy, and Lew Gantwerk (front row from left to right) Joanne Canady-Brown, Michele Siekerka, Samantha Kaiser, Darya Gidaspova, and Tara Barakov. Dazzle: Mad Hot Ballroom raised over $200,000 and all donations will support YA in its mission to inspire young people and expand their learning through the arts. The generous donations included $52,000 that was raised in a Fund-A-Need Auction for YA’s Early Childhood Initiative to bring arts programs to our youngest learners, led by YA Trustee and Antique Roadshow regular Sebastian Clarke from Rago Arts and Auction Center. A highlight of the night, five VIP dancers, paired with professional dancers, competed for the disco ball trophy and included Joanne Canady-Brown (Owner, Head Baker of The Gingered Peach in Lawrenceville), Lew Gantwerk (Former Executive Director, Center for Applied Psychology at Rutgers), D.A. Graham (Vice President, Global Integrity Leader at Nielsen Company), Mark Murphy (President, Lead New Jersey), and Michele Siekerka (President, New Jersey Business and Industry Association). 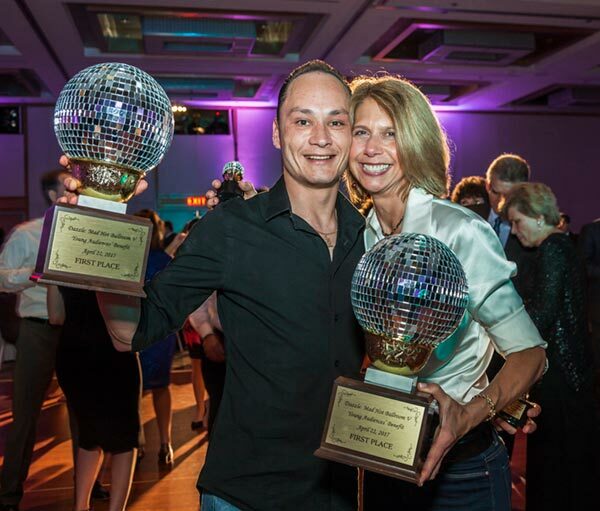 They all gave stellar dance performances and after a very close race, Michele Siekerka and professional dance partner from Fred Astaire Dance Studio, Ilya Abdullen, garnered the coveted prize (and bragging rights) dancing to the song “American Woman”. Joanne Canady- Brown, Lew Gantwerk, D.A. Graham, Mark Murphy and Michele Siekerka join the ranks of Dazzle VIP dancers from the past three years including: Barbara Coe, Carol Cronheim, Chris Daggett, Denise Wood Darder, Sue Evans, Dan Fatton, Jill Jachera, Chris Long, Tamara Matteo, Bobby Mascia, Stacy Mattia, Jon McConaughy, and Michele Minter, Katie Hughes Redmond, Jeff Perlman and Bryce Thompson. Another exciting and inspiring part of the evening was a powerful dance performance by U.S. Wiggins College Preparatory Lab Family School students from Young Audiences’ Adopt-a-School Initiative. The program is an innovative partnership between school districts, funders and Young Audiences that brings arts education back to the underserved school children. 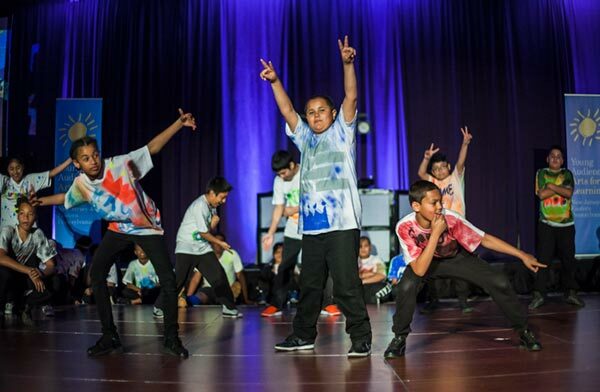 Wiggins Elementary School brought the room to their feet with applause when they shared what they learned in a hip hop dance residency taught by Young Audiences’ teaching artist group Hip Hop Fundamentals. Dazzle: Mad Hot Ballroom V received additional support from generous corporate sponsors, including Investors Bank, M&T Bank, NJBIA, Bliss Travels, Borden Perlman Salisbury & Kelly Insurance, Drinker Biddle, Fred Astaire Dance Studio of Princeton, Mathematica Policy Research, Merrill Lynch, NJM Insurance Group, NRG Energy, Robert Wood Johnson University Hospital, and UBS Financial Services. For partnership, corporate sponsorship opportunities and to be considered as a VIP dancer for YA’s 45th Anniversary Mad Hot Ballroom Gala on April 21, 2018, please contact Denyce Mylson at [email protected] or 609-243-9000 x202. Founded in 1973, Young Audiences New Jersey & Eastern Pennsylvania is the premier arts-in-education resource in the region, providing high-quality performances and artist-in-residence programs to schools in all 21 counties of New Jersey and the 7 easternmost counties of Pennsylvania. Young Audiences’ teaching artists represent all art forms—from dance and theater to music, language and visual arts. Since its founding, the organization has reached over 12 million children with essential arts education experiences.